... maybe I misunderstand something but rather than funny what's implied seems rather racist. Not like japanese are better towards chinese but still. Or maybe that's just me seeing things, considering how are China/Japan relationship usually. We don’t know how good the sample is but I guess a tracking firm has its tools to build a representative sample—especially one which has been operating in the industry for decades. Also, it depends on consumer preferences too. Perhaps the sample was representative a year ago but then casual gamers started to rely on digital purchases too. What, the ad does not mention Japanese, like at all. It is a typical commercial for advertising tutorial school. You can find a lot of them in China. I think this ad is aiming to invoke your "elitist" feeling towards people who play games. It is not a good message, per se, but I think it works. It also corroborates with the jab that often involves japanese's english level being very poor (which might be true per se). Ah, this is not the way I see it. 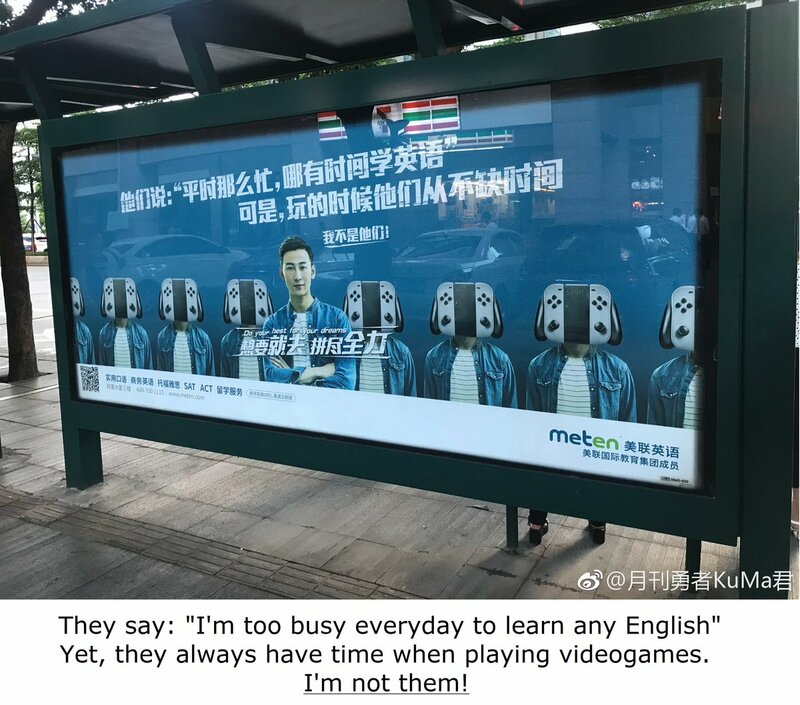 The idea of "playing videogames is bad" is still prevalent among Chinese, so this ad is used to invoke elitist feeling against players. In fact, Switch is hot in China. It is one of the top sellers on JD.com (a site like Amazon) on its sale day. I don't have any figures, but some games are selling really well on sites like Taobao (they show the sales number, but I never bother looking them up), like Xenoblade 2 is extremely popular because many Chinese players love playing RPG. Yes, many Chinese are still hold a grudge towards Japan due to various historical and political reasons, but I think they are most likely senior citizens. Youngsters consume Japanese media regularly and many of them understand it is important to separate political and cultural sentiment towards Japanese. Regarding the superiority, nationalism is strong in China. It is indeed a bad thing as extreme and radical ideas can be produced by it. However, it is not only directing to Japanese but also many other countries. I do hope some people would be more humble towards foreigners. Anyway, while the ad can be interpreted in different ways (mostly unhealthy), I really don't think it is more than an insult towards videogame players in general. Famistu doesn’t get PSN and XBL figures directly like NPD? If not I wonder why not? To be able to get the message you assume to cross Chinese people's mind, they need to know that Switch is a gaming device made in Japan in the first place, which the majority of the target audience of that ad most assuredly don't. Switch is popular around console gamers in China, but that's still a very small circle compare to the total population of China. Hopefully octopath traveller actually the delivers the strong legs it looks likely to have. It seems like it'll end up being a big success. It seems like it could send a positive message to 3rd parties. I think it'll end up being a million seller but it's hard to tell this far from release. I'm going to sing the same gospel as on the other threads: i firmly believe that both Splatoon 3 and MK9 will be released in 2020 to help pushing the new switch pro based on tegra x2. Fully compatible with og switch off course. I just can't understand why they would do that. Splatoon and Mario kart are stilling selling gangbusters and are ripe for more content. It feels like they'd just be pulling the rug out from under them. Why not make other games and let these 2 keep on selling? I think there is a high chance of a revision and maybe a price drop next year but I don't see either of those releasing. I think they should just make a Splatoon spin-off. Because by then, the sales of these games may have slowed down a little. And more importantly, because they will want to push their new hardware and both games are among their heaviest hitters. Mario kart will be quite an old game by that time and while Splatoon 2 will only be 3 years old, releasing a new iteration will help it staying fresh especially if octo-expansion was the last beefy dlc. Same reason why the released a real Splatoon 2 on Switch rather than porting the excellent first one from the WiiU. I don't think that the concept of console generation makes sense for Nintendo anymore and in that sense, I expect the release pattern of some first party franchises to be altered. Nintendo seems to understand that the reason that they develop a healthy ecosystem of evergreens is because they dont overly serialize their big games. They are ok with you buying another game from their first party catalogue than just keep buying the sequel from the same series. Ok, what kind of Spin-off Splatoon would have if the intention is to stretch the momentum of the game? A dance or rhythm game ala Persona? Some kind of game to expand the lore, like a rpg? With no rhythm heaven, Off the Hook x Squid sisters would probably make a lot of money. Unless there’s massive expansions to MK8D, there would be no original MK game this generation while last gen we got two. There's a rhythm minigame in Splatoon, maybe a fully expanded standalone release considering how popular the OST is. People still play games even without DLC you know. X-com/valkyria chronicles/mario vs rabbids influenced srpg. Codename steam ain't likely to get another shot. Might as well make a splatoon one. MK - 1 game per 1 system, just like mainline Animal Crossing, NSMB or Super Smash Bros. now Nintendo has only 1 system, not two, and MK8D is still selling around the world like a completely new MK game even without big DLCs and regular updates (look at the charts WW), and will continue to sell during all Switch lifespan. There's no need in MK9. It'll be released on Switch 2, just like Splatoon 3, Smash 6 etc. They should revive JAM WITH THE BAND with Splatoon. And that successor will come in 2020. I don't expect the current switch to be obsolete before 2022-23 as it will run all released games. But I expect them to release a new hardware every 3-4 years. Kind of how new iphones are being released every year, except on a much longer timescale. Similarly, I would expect a switch pro^2 to release around 2023-24 while the switch pro will receive software till about 2026 (OG switch being killed in 2023). They said that they wanted the switch family to last for 10 years. That could be an interesting way to go. Also, releasing a new Splatoon isn't as resource intensive than releasing a new Zelda it seems. They could do it in 2 years, and octoexpansion looks very much like almost a new game. I don't think that's impossible but I don't think it will happen. Splatoon 2 has sold around 2.5 million in Japan. When all is said and done that will end up being less than half its lifetime sales IMO. I doubt Nintendo is rushing to get a sequel out. Likewise Mario kart is a game that will just keep selling for the life of the system. I can see the argument that there has been no 'new' Mario kart for switch but this one is selling like an new game so it makes no difference. The thing is right now Mario kart and splatoon are already huge franchises on switch that will still be selling well next year. What's more likely to bring in new people, a sequel to those games or new games in other franchises or new IP's? Sure they need something big next year but they have Pokemon gen 9, animal crossing, metroid 4, Mario maker etc still to come. 2019 is set to be the biggest year for switch SW without sequels to those games. Gimme a rhythm game like Project diva. It's not dead to need a revival actually. It's pretty damn good. You can make your own songs and you have even a Vocaloid-like idol character in the game that can sing them for you. If you look for バンブラｐ on Youtube or Nico Nico you'll see a lot of cool stuff people do with it. It's not about costs. ItsI about maximizing sales. Not of individual series but ecosystem as a whole. In the long term. Splatoon sequel undercuts prior one. Splatoon spinoff, both keep selling. See what Nintendo does with Mario. Same thing here. so what you're saying is, that's is definitely what nintendo is gonna go with? I dont think the succesor will come in 2020. I think there will be a revision that is geared to the portable audience in 2019. In 2021 they would release a new design going after a different audience that still plays all Switch games. In 2023 they release Switch 2.0. Significantly more powerful. Switch 1.0 game development doesnt completely stop until 2027. I'd expect mostly Switch dual 1.0/2.0 releases for the first few years with a lot more significant 2.0 exclusive titles hitting by the third or fourth year that Switch 2.0 hardware had been on the market. Rinse and repeat the cycle with Switch 3.0 capable of playing all Switch 1.0 and 2.0 titles. If they want to keep the current Switch relevant, and they should, the new hardware can't be too far off in terms of power; though this time, they might go for a custom chip as well. That being said, an X2 with little or no underclocking would be quite a step up from a the underclocked X1 powering the Switch right now. Nintendo is both in a great and a tough spot. The Switch concept is amazing because it makes possible to play roughly similar games on the go than what we played only in our living rooms so far. They were smart to take advantage of the fact that mobile technology has evolved far enough to allow for a portable device to play Doom, Ark, or Warframe. That being said, the new generation of console is just around the corner and while cross-gen titles will probably exist, the Switch is going to have a hard time keeping up in terms of power and could be downgraded from "hybrid console" to "another Nintendo handheld" in the global perception and in the scope of third party releases. This is why I believe that they are bound to release a more powerful device rather sooner than later (September 2020 would be my bet), while keeping the current switch alive for a few more years after (till 2022 at least). Hence the comparison with the smartphone market where phones from 4-5 years ago can still play most of the modern games with gimped performances. In that sense, Nintendo is back in the power race, except it's a race where the challenge for them will be to stay close enough from their competitors to receive some third party support for some multiplatform games to be developed with Nintendo's console in mind as well; it's something that was mentioned recently by Panic Button, where they basically said that Doom and Wolf 2 hadn't been developed with the Switch as a possible platform, but that future 3rd party game may take this new parameter into account rendering ports easier. I wouldn't be surprised if the next Doom of Wolfenstein look significantly better and run smoother on Switch than the ones we have now. Overall the Switch is always going to be about compromises, and they've done a good job so far hardware-wise. I have nothing but my opinion to support this, but I sincerely believe that a new hardware will be released in 2020, and that either new Splatoon, Mario Kart, Zelda or Mario will be released to push its sales. The point is that Nintendo would usually release two of these games per generation. 2 Mario Kart games per generation since the GameCube. Switch doesn’t even have its own Mario Kart game. So just because the switch is Nintendo’s one platform going forward these dev teams will just let franchises rot for 6 years or so? saying Tegra would keep Switch relevant when PS5 comes out is like saying putting a fan behind a tricycle will help it next to a F1 car. Beyond processing power what bottlenecks Switch or future devices (portables) is heat dissipation, something like X1 itself already has to run underclocked (even on Dock) to avoid high temperature that would hinder the life spam of the machine. We believe roughly the same things except my timescale is shorter than yours. I also expect intercompatibility between 2 successive machines: 1 with 2, 2 with 3 but without 1, and so on. At least, that's what I would do if I was Nintendo-san. That's also why I do not expect the Switch to see a price cut before the 2nd iteration comes out (2020 in my prediction). Anyway, interesting stuff; Nintendo has all the cards to take over the market with the Switch concept. I don't post in these threads much but I want to point out the Tegra X2 was revealed a long time ago and it was made for cars and not built at all for gaming systems. Yeah, I imagine anything on a switch revision would be more custom. They could use it as a base at least. Now that the Switch is a proven success, I guess they would be smart enough to work more closely with Nvidia to get the best possible performances per watt in games. This partnership has the potential to be a real win-win situation. A Splatoon spin-off is almost certain, to exploit the franchise popularity. A sRPG and/or a rhythm’n’game are more likely than anything else. I think splatoon would make for a good jrpg and also a smash like fighting game. But smash obv already exists. A rhythm game would work too, but I don't care about the genre much so I wasnt considering it. Splatoon 3 definitely wont happen this gen though. They might do another paid DLC. I always said A mk9 would eventually come this gen so I'll stick to that for consistency sake. Idk. For their multiplayer games to me Nintendo seems keen on not splitting the audience by a) not releasing the same game on multiple systems (obviously) b) not doing paid expansions and c) not releasing sequels on the same console as its predecessor. Switch might be different though since it's a hybrid. What's the gameplay of style savvy? X2 has a lot of its muscle dedicated to AI for cars parking and stuff, rather than "waste time" conditioning that for what would be drops in an ocean tier upgrade, I would instead prefer em to ride with switch and work harder on a proper SoC for Switch 2.